VCU has completed one of its major downtown construction projects. 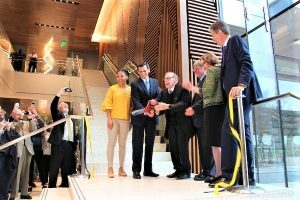 The university on Monday cut the ribbon on its new eight-story, 154,000-square-foot College of Health Professions building at 900 E. Leigh St. The building as seen from East Leigh St. The building will open this summer and be fully operational for VCU’s fall 2019 semester. Four dormitories were demolished to make way for the $87.3 million project. Construction took almost two years. The College of Health Professions formerly was known as the School of Allied Health Professions before a rebrand last May. 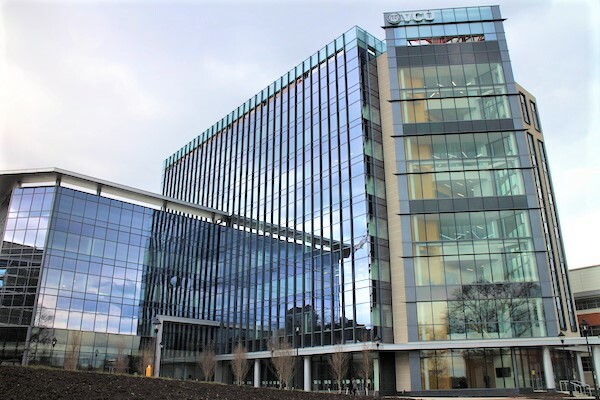 The new building is aimed at bringing the school’s concentrations under one roof after having been scattered across 13 sites on VCU’s campuses. Cecil Drain, the school’s outgoing dean, was joined by VCU President Michael Rao, VCU Health CEO Marsha Rappley and MCV Foundation board chair Harry Thalhimer in speaking at Monday’s ribbon-cutting. Drain is retiring from his post, with Lex Tartaglia serving as interim dean while a replacement is sought. VCU dignitaries, including outgoing dean Cecil Drain, cut the ribbon on the building Monday. The building will house nearly nine academic programs, including physical and occupational therapy, anesthesia and health administration. With the new building, VCU also added a new concentration in sonography. Tartaglia said adding the sonography program will help the CHP grow its student population about 10 percent, from 950 to 1,050, in three years. All of the event speakers thanked the Virginia General Assembly, which funded the majority of the project in 2016. VCU covered about $11 million of the building’s cost. Whiting-Turner was the general contractor and EYP Inc. was the architect. 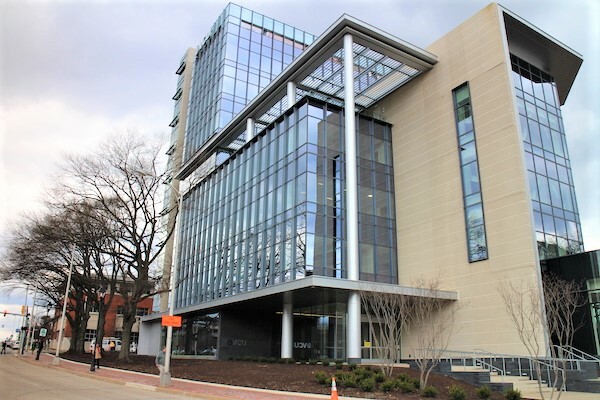 With the new building open, VCU will remain busy along East Leigh Street as work continues on one of its most sizable projects in recent memory: a 603,000-square-foot adult outpatient facility. Work began on the $349 million project last summer, with a summer 2020 target completion date. Also downtown, VCU is planning to break ground this spring on a $350 million children’s hospital at 1001 E. Marshall St.
Clarification: Lex Tartaglia is set to serve as interim dean following Cecil Drain’s retirement. A replacement for Drain has not been announced. 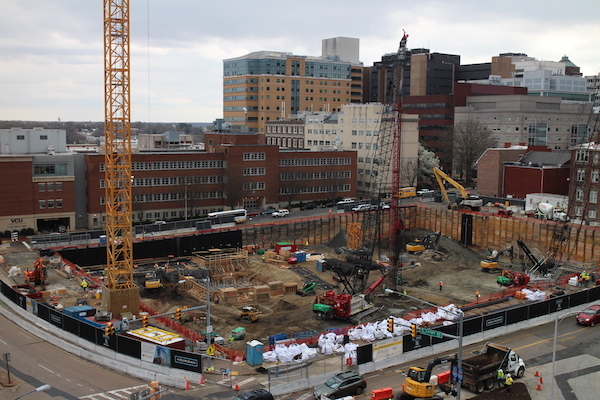 Work continues across the street at VCU’s $349 million adult outpatient facility. 1 Comment on "New $87M VCU tower debuts"
VCU is transforming the City into a national research destination.